The Band of Holy Joy were an odd lot. I never rated their records, but I saw them put on a Christmas show once at the Albany in Deptford, on their home patch, and it was fantastic. They were like Dexys meet the Bad Seeds, or where Brecht met the Foundations. There was a great documentary too, very early on, where they’re getting ready for a night out to go and see the Salvation Army perform on the streets somewhere in South London, which was a nice touch. The reason I mention this is because the singer once listed Harboro Horace as one of his heroes, and excitedly recalled meeting him at a party. Harboro Horace is now better known as Ady Croasdell, and he’s one of the great London figures. He also helped to change completely the musical map. He must have had lots of people gushingly telling him that at parties. The names Ady Croasdell and Harboro Horace are synonymous with that of Kent Records. It was back in 1982 that Ady put together the first Kent soul set for the Ace stable, and little by little the label changed the way old soul music was perceived and used. By creating records that were lovely artefacts full stop Kent took away something of the necessity to collect old 7”s. Perhaps unwittingly it took vintage soul music out of the clubs, and into the living rooms and bedrooms. You would put on a Kent LP while you were getting ready to go out, while you were doing the housework, while you were doing homework. Kent made some of the world’s most beautiful and uplifting music accessible. Before Kent’s compilations there was very little. It was not possible to walk into a shop and see stacks of soul compilations. But over the next ten years Kent put out about one hundred sets of soul-related sounds. Many of them were very special indeed. Many people discovered the joys of Maxine Brown, Tyrone Davies, Mary Love, Judy Clay, Jackie Day, Big Maybelle, and Irma Thomas in this way. Many of these records had sleevenotes by Ady’s Harboro Horace persona, which were much loved. Most of the records looked fantastic, with sleeves by Ian Clark or better still Phil Smee, and that was very important. Ady was a huge soul fan from Market Harborough, who had moved to London in the early ‘70s, and drifted into the wheeling-and-dealing way of life, buying and selling old soul 45s. In 1979 with like-minded souls he set up the 6Ts Rhythm and Soul Society in the heart of London’s West End. This venture brought together old faces with a new mod generation, and catered for a growing soul need. In time the 6Ts club nights would become an institution in their own right, and for many the 100 Club All Nighters are as special and as enshrined in mythology as those at the Twisted Wheel and Wigan Casino. In its second decade Kent moved into the CD market, and discovered a new lease of life. Leaving aside the aesthetics debate about vinyl versus CD, the new format allowed for many more minutes of music, with detailed liner notes and accompanying photos. Kent took full advantage of the possibilities, and through Ady’s stewardship established a reputation at the quality end of the soul reissue market. One of Kent’s strengths remains its doggedness. The compilations are cohesive. They’re not just an odd hotchpotch of tracks like other less diligent outfits threw together. Kent’s at its best in putting together a series of themed-sets. We all have our favourites. The Hotlanta Soul CDs are particular favourites of mine, as are the ones from the Atlantic stable. 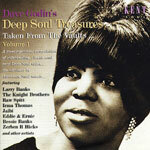 The series that really took off for Kent was Dave Godin’s Deep Soul Treasures (Taken From The Vaults). Godin was a soul evangelist from suburban south London, a teenage fan of black rhythm and blues who zealously spread the word about the music that changed his world. He formed the Tamla Motown Appreciation Society, ran his own record shops and label to make available this amazing music, and wrote passionately and scholarly about the significance of soul music. He would open the eyes and ears of so many people. The Deep Soul series seemed a dream come true for people like myself who rate Dexys’ 'Keep It Part Two' among the greatest singles ever. The emotional intensity and awesome artistry of recordings like Kenny Carter’s 'Showdown' and Larry Banks’ 'I’m Not The One' remains mesmerising, and many will be eternally grateful to Godin, Croasdell, and Kent for introduced them to performances by Eddie & Ernie, Jaibi, and the Knight Brothers. There was a bittersweet irony to the way Godin’s favourite album of all time, the definitive Deep Soul masterpiece that is the Jerry Williams-sculptured I’m A Loser by Doris Duke, saw light of day again as a Kent reissue shortly after Bexleyheath’s favourite son passed away. The incredibly high standards of that first Deep Soul set were maintained over all four volumes in the series, and the CDs looked so right too, thanks to the Phil Smee design. Context is everything was an incredibly important phrase generated by Godin, and that’s what Kent does so well. Croasdell and comrades seem to be so disciplined, forever searching, learning, and sharing their beloved soul music. Their activity has been truly liberating and egalitarian. I still wear my Kent badge with pride.